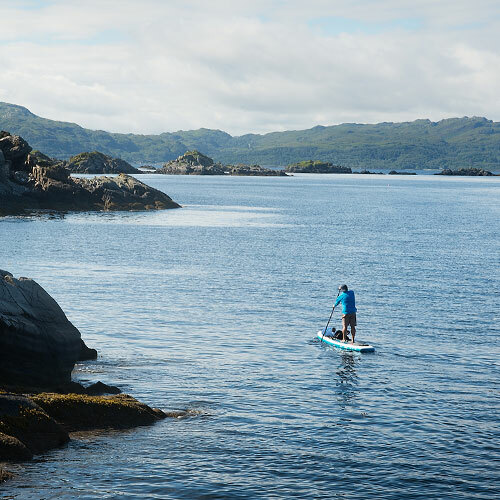 A week of world-class paddleboarding and wild camping on the spectacular West Coast of Scotland – the perfect trip to end the 2019 SUP season! Our expert guides will teach you essential coastal paddling and wild camping skills as we journey through the stunning Scottish Highlands, camping on remote beaches as we go. Enjoy a chance to get away from it and enjoy the abundant wildlife as we seek out isolated sandy coves, rocky headlands and sheltered sea lochs. Your guides are WSA Adventure trainers who train people to lead in these environments. We operate at a 1:4 ratio, carry VHF radios and have the highest safety standards. We will send you a full kit list on booking. Please contact us if you have any questions. This trip is suitable for those with some experience of journeying by SUP. The trip is designed for paddlers of all speeds but you’ll need be confident paddling a touring style board for a full day, with breaks. This trip will be an exciting and immersive introduction to expedition paddling. You’ll leave confident in planning a multi day trip and wild camping with the bare minimum impact.